A conversation with Bertalan Meskó, MD, founder and managing director of Webicina.com, Michael Spitz, SVP and Managing Director at Zemoga, and Silja Chouquet, owner and CEO of whydot GmbH (see bios), about a proposal by Dr. Meskó that urged pharmaceutical companies to appoint employees as Wikipedia “spokespeople” who would perform all Wikipedia article edits on behalf of the company. You may also visit this Pharma Marketing Talk Segment Page to listen to the audio podcast. This show and ALL Pharma Marketing Talk shows are available as podcasts via PMT on iTunes (FREE!). In comments submitted to the FDA, PhRMA suggested that manufacturers would welcome correcting misinformation about their products posted to sites like Wikipedia if these corrections were not subject to FDA regulation. “FDA,” said PhRMA, “should confirm formally that, while it is not possible for manufacturers to monitor or correct all inaccurate information about their products on the Internet, such corrections by manufacturers in response to inaccurate postings will not be considered promotional labeling. FDA’s adoption of such a policy would thereby allow manufacturers to correct inaccurate information about their medicines on the Internet or social media (e.g., Wikipedia, Sidewiki, blogs, or other websites) if they should become aware of such information” (see “Accountability for Pharma Content on Social Media Sites“). 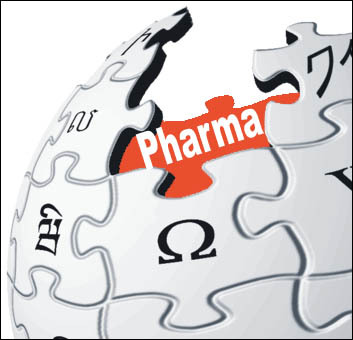 The place of Wikipedia in the dissemination of medical information online is indisputable now. If you want your customers to access information about your products from the quality perspective and in the simplest way, you have to deal with using Wikipedia. Based on the pretty negative past encounters between pharma employees and Wikipedia editors (pharma employees trying to edit entries about their own products in a quite non-neutral way), we advise you to employ a Wikipedia editor if you want to make sure only evidence-based information is included in entries about your own products. Appointing someone from within your company as a “spokesperson” in Wikipedia who would perform all edits on behalf of the company is an excellent way to update those entries. For more details, please see our open access social media guide [see Resources below]. But basically, we, Wikipedians, are more than open to starting a discussion about this with you. I’m looking forward to working together. Boehringer Ingelheim responded to Berci via Twitter: “We look for patient safety issues & react. Its important to stick to Wikipedia policies too, so all transparent.” But when asked by Berci if BI had posted anything online about this, BI responded “No at this point in time we have not….yet,” seemingly leaving the door open. Should pharma correct Wikipedia “misinformation” about their products under any circumstances? Who determines what is and is not “misinformation?” What do you mean by “evidence-based” information in this context? Is drug misinformation as big a problem as some people think? What research on this topic is there out there? Should pharmaceutical companies appoint employees as Wikipedia “spokespeople” to perform all edits on behalf of the company? When pharmaceutical company employees or agents correct “misinformation” on Wikipedia how should they reveal their ties to the company? When pharma corrects Wikipedia “misinformation” about Rx products, should FDA (or other regulatory agencies) consider this promotional labeling subject to regulation? How do regulations in different countries apply? Bertalan Meskó, MD graduated from the University of Debrecen, Medical School and Health Science Center in 2009 and started PhD in the field of personalized genomics. He is the founder of Webicina.com, the first medical web 2.0 guidance service and thinks medical education and communication between physicians and patients will be revolutionized with the tools and services of web 2.0. He is @Berci on Twitter. Silja Chouquet is the owner and CEO of whydot GmbH, an agency specialized in social media consulting, coaching and training. Her fields of expertise are the creation of patient-focused social media communications and marketing campaigns. Michael Spitz is SVP and Managing Director at Zemoga, an award-winning digital innovation company, and editor of the Pixels and Pixels digital pharma blog. Spitz combines healthcare, interactive, and technology expertise to build compelling solutions for the health industry. Follow him @SpitzStrategy and keep this important conversation going for the betterment of patients worldwide. Reaching a Targeted Young Audience Via Instagram: Amazing Social Media Campaign or Creepy Spam?